Join us in the Liquor Lounge (upstairs in the Dáíl Bar on Middle Street) at 8:00pm on Tuesday April 9th for a splendid auction of cartoon originals and prints. MC and auctioneer for the evening will be Brendan Savage, there will be a raffle, booze and general fun, and all proceeds go to putting on the next festival! 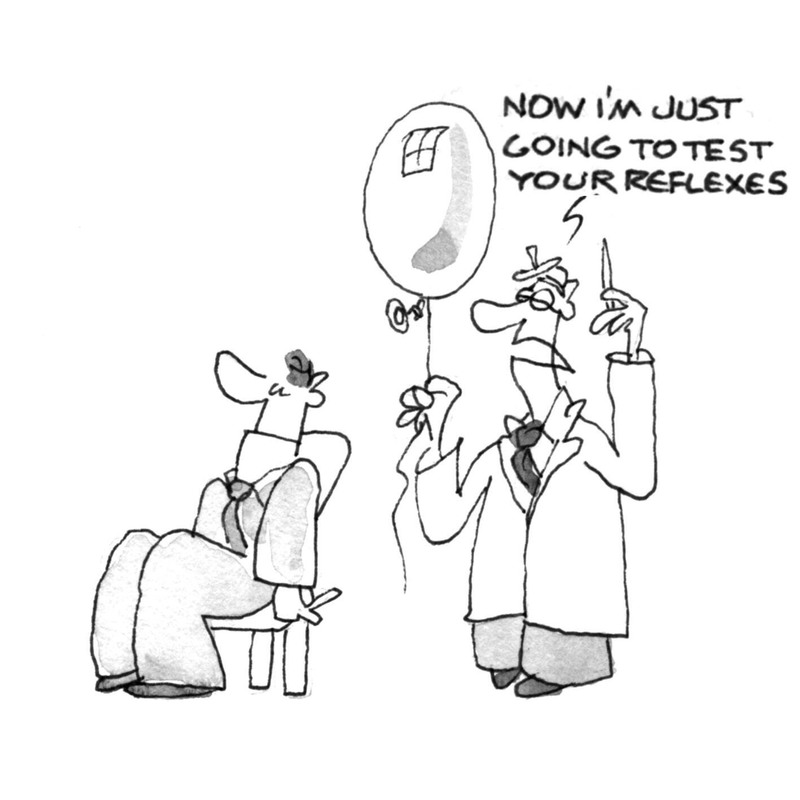 We start with a gag by the inimitable Tom Mathews. Some call Tom the rock star of Irish cartooning. Tom also knows a thing or two about art criticism. And of course, fine cinema. 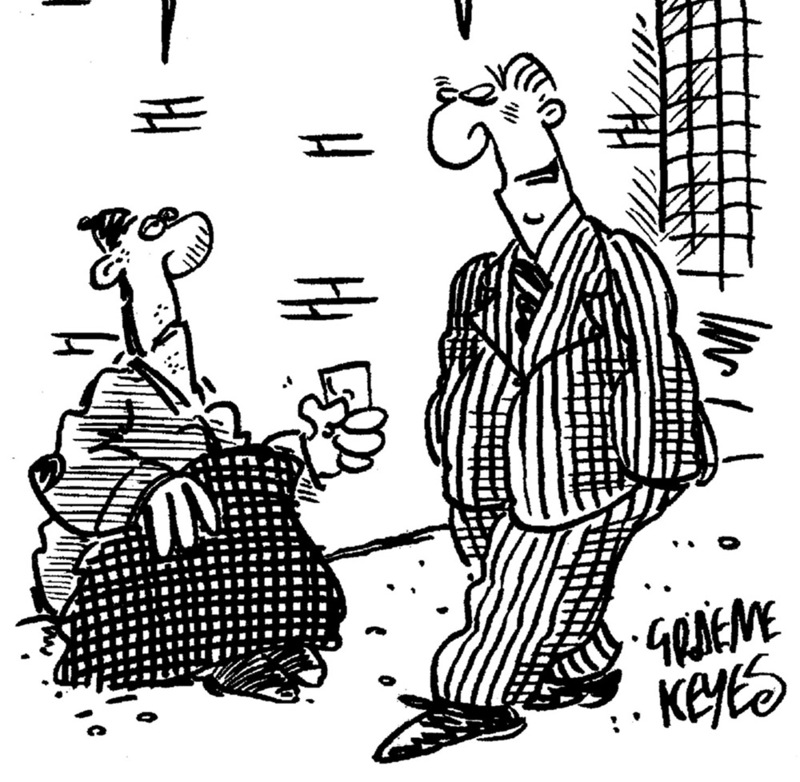 Ed McLachlan is one of the greats of British cartooning. His work appears in many publications including Private Eye. Two great original drawings from comic strip The Last Resort in the Sunday Business Post. British underground comix maestro Hunt Emerson retells the Irish legend of Bishop Moling and the fox. Northern Ireland’s Ian Knox on Brexit and the backstop. And while we’re in the North here’s a take on the 12th, as Gaeilge. Internationally famous artist Cristina Sampaio sends this disturbing and powerful take on Brexit from Portugal. Cristina gives us a controversial take on European politics. 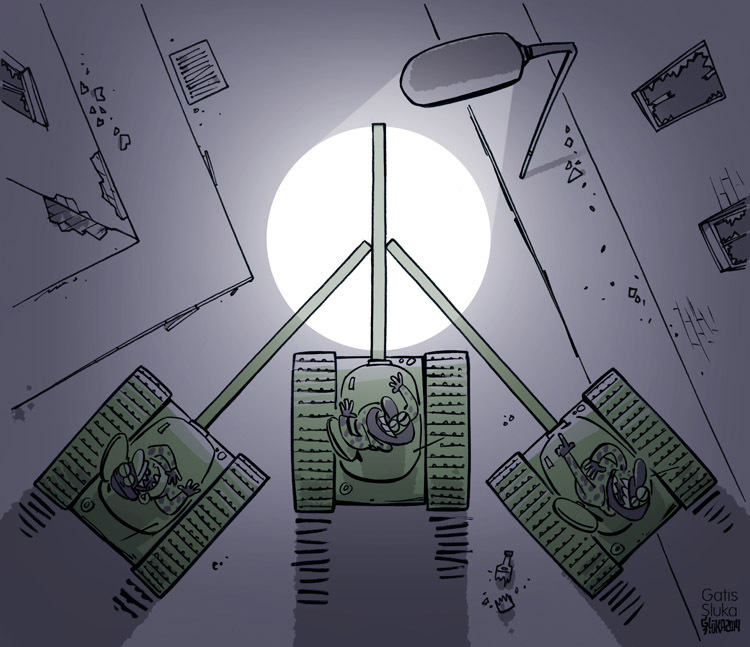 Another British cartoon veteran, Jeremy Banx casts a jaundiced eye on victory. Palestinian refugee artist Fadi Abou Hassan provides this powerful image of freedom. One of the funniest cartoonists working in Ireland today, TwistedDoodles tells it like it is about avocados. What would the local pharmacist have thought of your smartphone pictures? Irish-American New Yorker cartoonist Liza Donnelly on the Trump policy of separating migrant children from their parents. Inspired by the Kavanaugh hearings, The New Yorker’s Liza Donnelly illustrates a woman’s struggle to be heard. Italy’s Marilena Nardi is one of the greatest talents in cartooning today. This is her take on the dangers of social media. Here Marilena Nardi depicts the burden of other people’s emotional needs. As well as being a leading cartoonist, Marilena Nardi teaches drawing at the Venice Academy of Fine Arts. Nardi’s portrait of Mata Hari, exotic dancer and alleged double agent during World War 1. From his vantage point at the end of the Great War, a soldier foresees a century of tragedy and failure. Guardian cartoonist Martin Rowson sees similarities between the muddy trenches of WW1 and the morass that is Brexit. 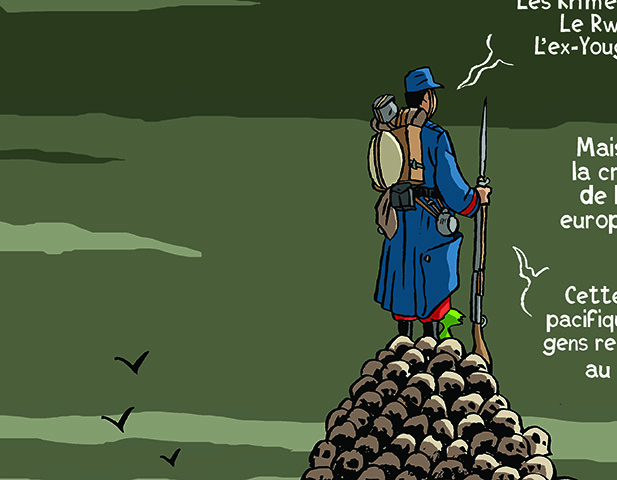 An Italian cartoonist in Ireland, Virginia Cabras sees a new kind of trench warfare. A fresh take on soldiering from German eccentric Teja Fischer. Galway comic artist Tigerjess recalls campaigning in the last referendum. Russian veteran cartoonist Igor Pashchenko depicts a kiss. Irish Times Cartoonist Martyn Turner gives his take on Trump’s protectionism.